Rainwater is harvested through the three downspouts in the house. This Recirculation Pump is what ensures instant hot water. PEX tubing is used because it is recyclable and very easy to work with. Flow meters like this one measure the water flows in the house. This roof drain on module B is how the rain reaches the reflecting pool. The design of our water systems has been to use inexpensive, yet practical technologies to reduce potable water waste and increase comfort. Simultaneously, we have used systems that are tangible enough to be understood and troubleshooted by the homeowner. We have used a recirculation pump to drain lukewarm water in the hot water line and have it replaced with hot water. This saves water because users don’t have to go turn on the shower 10 minutes ahead of using it in order to let the water warm up. However, most recirculation pumps use a lot of energy because they constantly circulate water. Yet we have coupled a motion sensor with our pump, so it doesn’t start circulating water until someone enters the bathroom. Thus, we save water and energy with our recirculation pump while also delivering better performance than a conventional plumbing design. The greywater generated by the house is filtered by a passive plant system called the GPlant. The system is composed of seven layers: loam, sand, gravel, biomatrix, geotextile. Each layer is purposed to filter specific components out of the greywater to clean it. The cleaned greywater, termed recycled water, is then used for irrigation. Metrics about the Refract House’s water use are featured on the building dashboard built by Lucid Design. We will be measuring potable water consumption, wastewater generation, greywater generation, shower hot water use, shower cold water use, and irrigation usage with flowmeters. Through our partnership with Lucid, the homeowner can educate themselves about their water habits and accordingly adapt them. Instead of using copper for the supply piping of the home, the Refract House uses Wirsbo AquaPEX. 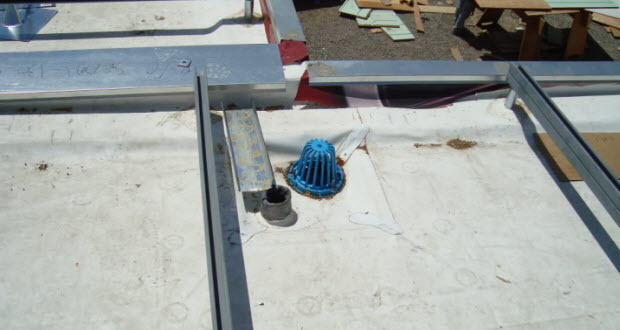 Cross-linked Polyethylene (PEX) does not leech, is flexible, and has less heat loss. More than anything else though, PEX is easy and quick to install: There is no soldering, all fitting joints are cold expansion, and the tubing has a memory. Refract House harvests its rainwater runoff. The reflecting pool is the collection area for the rainwater, making it both an aesthetic and sustainable feature. Instead of using the traditional time-based water controller, we are using the WeatherTRAK Smart Controller. WeatherTRAK adjusts watering according to local weather, using weather satellites to determine local conditions. For example: If it was going to rain, WeatherTRAK would cancel the irrigation run for the day because the plants would receive appropriate water anyhow. A classic timing controller would still distribute water based off of the programmed schedule, which would result in overwatering. Heat pump water heating moves heat using electricity rather than creating heat, meaning they can produce 2-4 times as much heat as an electric resistance water heater using the same energy. Under new ENERGY STAR regulations, the only non-gas water heaters to be certified will be heat-pump type units. Several of these new units will be coming out in late 2009, and offer homeowners a chance to upgrade and save substantial amounts of energy and money. Refract House employs a split-type configuration with a separate dedicated heat pump unit which performs similarly to the upcoming integrated models. The heater can be controlled by our digital control system, allowing it to do most of its heating during off-peak hours, or when it is most efficient, depending on user choice.